The author uncovered traces of an organized and sometimes sinister tradition of quest for the Ark of the Covenant, and against this historical backdrop he mounted his own search for the sacred relic. In this book he tells the story of both his research and his own quest. - Publisher Part adventure story and part historical detective work, this is a quest into the real nature and current whereabouts of the Ark of the Covenant. The author has found, scattered amongst dusty archives and leading back through cryptically coded parchments, secret societies, the Knights Templar and even the Freemasons, traces of an organized and sometimes sinister tradition of quest for the Ark. Against this backdrop he mounts his own search for the sacred relic, a search that takes him to the tombs and pyramids of Ancient Egypt, to the walls of Jericho and the Temple Mount in Israel, and amidst civil war and political turmoil to the country in which the Ark is said to rest. ;Graham Hancock's other books include Lords of Poverty. 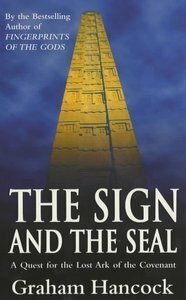 About "Sign and the Seal"
Part adventure story and part historical detective work, this is a quest into the real nature and current whereabouts of the Ark of the Covenant. The author has found, scattered amongst dusty archives and leading back through cryptically coded parchments, secret societies, the Knights Templar and even the Freemasons, traces of an organized and sometimes sinister tradition of quest for the Ark. Against this backdrop he mounts his own search for the sacred relic, a search that takes him to the tombs and pyramids of Ancient Egypt, to the walls of Jericho and the Temple Mount in Israel, and amidst civil war and political turmoil to the country in which the Ark is said to rest. ;Graham Hancock's other books include Lords of Poverty. Author and journalist Graham Hancock was an East African correspondent for the Economist and covered the Ogaden war between Somalia and Ethiopia for the London Sunday Times. Hancock has written a number of books, among them African Ark: Peoples of the Horn, Lords of Poverty, (which earned an honorable mention for the H.L. Mencken Award for outstanding book of journalism in 1990), Journey Through Pakistan, and the international bestseller The Sign and the Seal, which documents Hancock's real-life quest for the lost Ark of the Covenant. Also the author of the top bestseller, Fingerprints of the Gods, Hancock has appeared on television with Michael Palin in his Pole to Pole series. He has also made appearances on the BBC, CNN, and the National Geographic's Explorer series to discuss stories related to his book The Sign and the Seal.